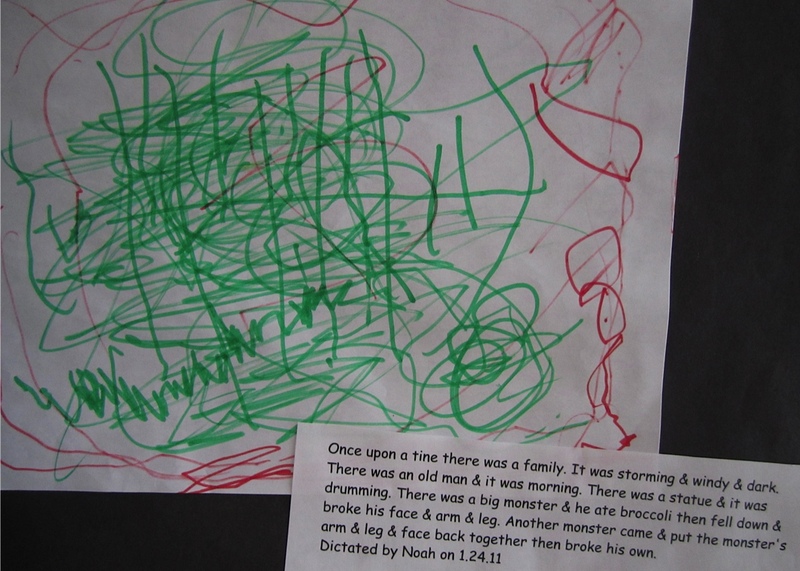 Children’s scribbles were once conceived of simply as practice for “real drawing,” but educators today recognize that scribbling is an important step in child development. Scribbling is the foundation of artistic development and is intimately linked with language acquisition. 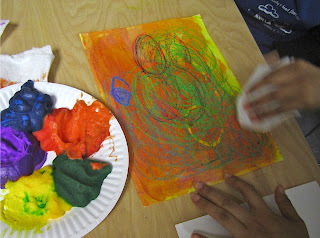 Young children love to scribble and adults will enjoy it too, if you give them permission to “let loose with a crayon". 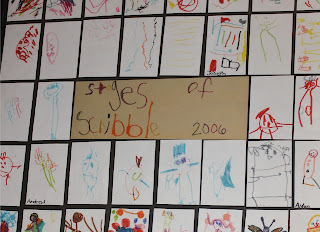 Scribbling reflects a child’s physical and mental process. When toddlers first pick up a crayon and make a mark, they experience a pleasurable moment in which they use a tool and produce a result. They don’t realize they are taking the first step of a long journey, a journey that will culminate around the age of 8 with a mastery of line that is remarkably controlled. They only know that in this powerful moment, something they did with their body created a visible result and that feels very exciting. 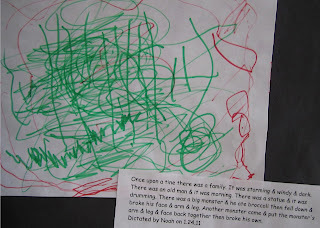 Mona has her 4 year olds work on long term book making projects that include scribble drawings with dictations. 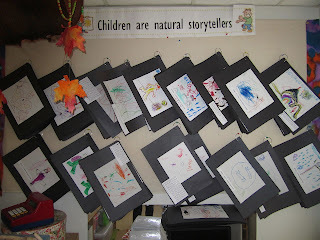 Children are indeed natural storytellers, and scribbling is how their visual story telling begins. No study of scribbling would be complete without mention of Rhoda Kellogg. Kellogg was a pioneer in the study of analyzing children’s art. Over the course of 20 years, Rhoda Kellogg collected and analyzed over 1 million children’s drawings from children ages 2-8. 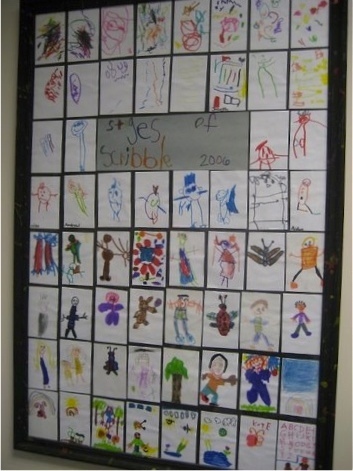 In 1967, she published an archive of 8000 drawings of children ages 24-40 months, focusing on scribbling and the early “ages and stages” of child development. Kellogg concluded that children need plenty of time for free drawing and scribbling to develop the symbols that will later become the basis for all writing and drawing. Before Kellogg, scribbles were considered nonsense. Children were discouraged or even forbidden from scribbling, and encouraged to copy adult models (sounds ghastly and misguided, but this shows how far we’ve come in understanding child development.). Here's something creative to do with scribble drawings - check out the "Stages of Scribbles" created by children at the Alpert Jewish Community Center in Long Beach, CA. 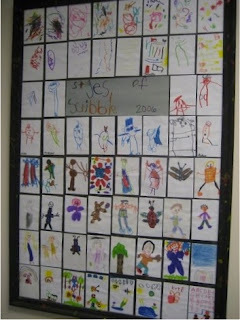 Assistant Director, Alayna Cosores, asked teachers to contribute examples of scribbles and compiled them into an Ages & Stages frame that hangs in their Early Childhood Office. 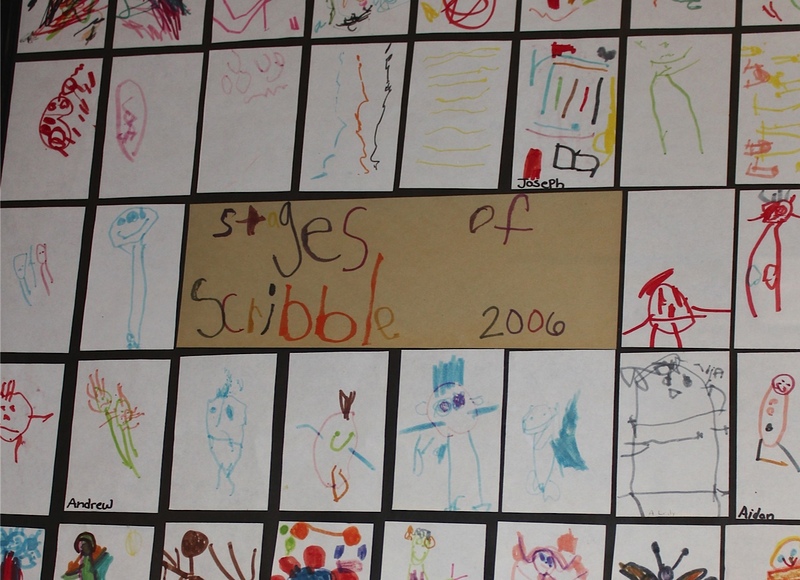 Not only is it colorful and fun to look at, "Stages of Scribble" reminds parents that scribbling is an important process to encourage at home. Why not try something like this in your own center, it costs so little to put together and will provide years of stimulating conversation. 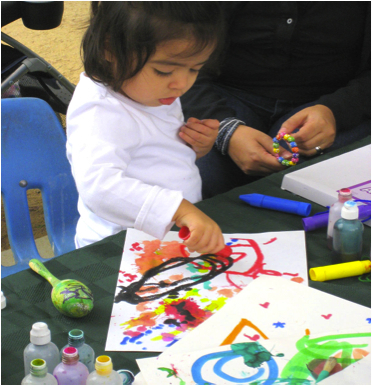 Last but not least, scribbling is not just for kids…it can also be liberating for adults! 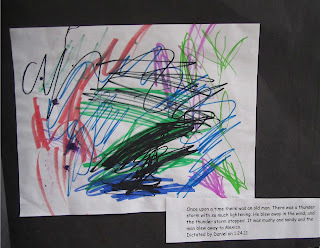 Scribbling is a physical process that emphasizes freedom of movement. It can help us relax and get into the sensory mode of our bodies as well as the creative, right hemisphere of our brain. 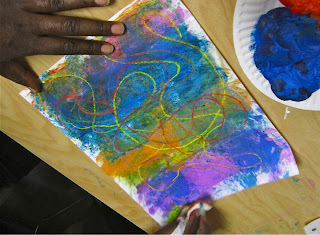 With this in mind, I often begin Teacher Trainings with some form of a scribble warm-up. 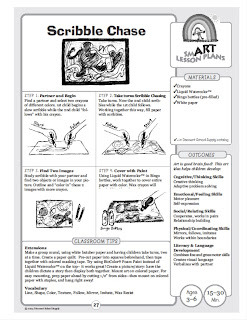 My favorite is a paired up exercise called a “Scribble Chase.” Click here for the printable lesson plan from my book Smart Art Ideas 2. While the original lesson plan used Colorations® Liquid Watercolor for the top layer, I’ve come to enjoy it even more using Colorations® No-Drip Foam Paint. Scribbling is it’s a great way to energize a room. 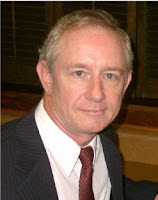 I suggest you try “grown-up” scribbling sometime soon.